Product information "HAIX Scout Black"
Soldiers often operate across a wide variety of terrains and need flexible footwear. The HAIX Scout Black provides a firm foothold on various surface thanks to a sole comprising a particularly hard-wearing mix of rubber and PU (polyurethane). This mix of materials and a rugged tread guarantee a secure grip, even on slippery ground. A high quality plastic/fleece insole and rubber edging also provide maximum stability. Strenuous activity during training or when on duty may bring you out in a sweat. The inlay and insole of the HAIX Scout Black reliably absorb moisture before bacteria is able to produce any unpleasant odours. A special lining around the cuff of the boot also helps to expel heat. Although the HAIX Scout Black is, of course, black in colour, your feet will remain pleasantly cool and dry during summer. The robust leather used in the manufacture of the boot is highly breathable. It also allows warm and damp air to be expelled whilst also reflecting the rays of the sun to prevent any overheating. The three-ply GORE-TEX® laminate in the boot’s inner lining is also breathable and will remove any residual sweat in an effective manner. This avoids any unpleasant build-up of moisture. 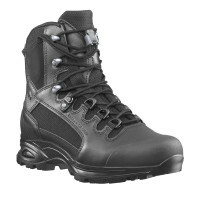 The HAIX Scout Black offers your feet maximum protection in the heat, rain and snow. It is completely waterproof and will also shield you against the heat and the cold. You may well come into contact with hazardous liquids if you deal with machines or weapons in the course of your duty. The sole of the Scout Black is resistant against substances such as oil and petrol. Soldiering can also place an immense strain on the joints and spine. An insole and separate heel cup cushion your steps to reduce pressure on the muscles. The inlay also protects you against the potential pain caused by uneven surfaces such as roots or penetration by stones underfoot. The HAIX Scout Black is manufactured in a combination of leather and textile. The material used is around two millimetres thick and is highly breathable. It reflects the sun’s rays to prevent overheating inside the boot and will leave your feet feeling fresh, even on hot days. A quick fastening system also makes the Scout Black very easy to put on and take off. Once you have adjusted the boots to the width of your feet, you simply lace them up by pulling up the tab. Excess laces are stored in a practical separate pocket. A two-zone lacing system enables the foot and calf areas of the boot to be adjusted to different tightnesses in order to provide a perfect individual fit. 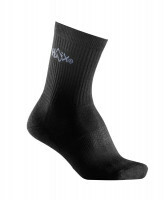 The HAIX Scout Black features an inner lining made of abrasion-resistant fabric. A three-ply GORE-TEX® laminate keeps it both waterproof and highly breathable. Moisture cannot penetrate, whilst warm and damp air is expelled at the same time. A separate heel cup and an insole cushion your steps as you go to decrease pressure on the joints and spine. The sole of the boot absorbs moisture before bacteria is able to produce any unpleasant odours. The inlay can be removed and washed if required. A special micro-dry lining around the cuff helps to expel any dampness, and a stable plastic/fleece insole integrated into the boot keeps your feet dry by also assisting with the moisture absorption process. The latter reduces discomfort from individual pressure points created when, for example, you step on stones or roots. In addition, the plastic/fleece insole offers a high degree of torsion resistance. This means that it will not bend and will give you extra stability to ensure safe passage across snow, rubble and ice. 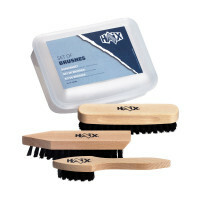 The outsole of the HAIX Scout Black comprises a hard-wearing mix of rubber and PU (polyurethane). This guarantees a particularly long product life. A deep tread makes the sole completely slip resistant. The rubber used in its manufacture is also colour fast and will not leave any black marks on light-coloured floors. Rubber edging gives additional stability. The outsole of the Scout Black is antistatic and protects your feet against oil and petrol. 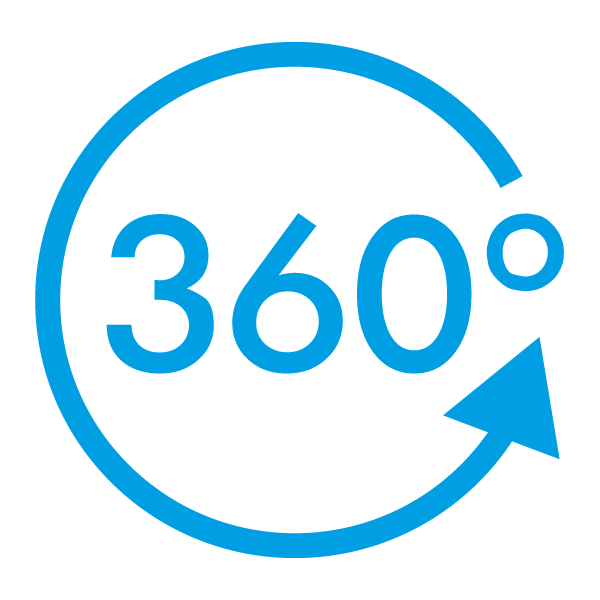 It also insulates against the cold and against heat up to a temperature of 300 °C. The Scout Black is the perfect military boot. It is a comfortable option which reduces pressure on your joints by cushioning your steps. Water, heat and cold cannot come into contact with your feet. The sole is also highly resistant against hazardous materials such as oil and petrol. Order the HAIX Scout Black now.